This is okay to use, okay to apply and good drying (2-3 minutes a coat). It is quite streaky on the first coat but does sort itself out on the second, thankfully! It's a nice enough blue. Lasted well. I love your Ciate swatches! This color is BEAUTIFUL and I want it so badly! Such a fresh and pretty shade of blue! That's a nice wintery shade, it looks great on you. I like such shades of blue, you've probably noticed. It even looks porcelain-like, I think. 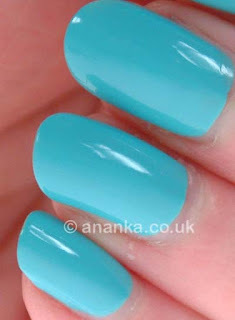 I do rather like this shade! It is very pretty, also for spring! Not at all sailor colour, but still I love it! This is so my kind of colour, looks great on you!